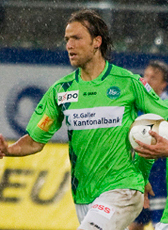 Dutch defender Tim Bakens and product of the Graafschap moved abroad in summer 2010 to sign a 2-year contract at Swiss club FC Sankt Gallen. At the end of his contract, he returned home and signed a one year deal until June 2013 at SC Cambuur Leeuwarden. Bakens became a free agent in July 2013. He moved back home to join his former club de Graafschap on a 2-year contract until June 2015. In summer 2014 he decided to start his retirement earlier than planned.